The scale of the threat to the deep sea’s biodiversity as a result of bottom trawling and other methods of deep-sea fishing is as yet unknown. However, it is potentially comparable to the threat to terrestrial biodiversity associated with the loss of tropical rainforests. Many thousands of species may be at risk, most of which are still unknown to science. Fragile deep-water ecosystems, coral systems in particular, stand no chance against the ruthlessly effective underwater “bulldozers”. Deep-sea structures are not merely damaged: they are obliterated in a manner akin to clear-cutting a rainforest. After heavy trawling, coral ecosystems on seamounts are reduced to mostly bare rock and coral rubble. Once destroyed, slow-growing deep-sea species are unlikely to recover for decades or centuries, or even lost forever. Stable living habitats such as coral and sponge communities tend to be both the most heavily damaged and the slowest to regenerate. Trawlers at anchor in the small port of Ban Phe. Photo: Eleanor Partridge/Marine Photobank. To make matters worse, the deep sea’s remarkable array of coral, sponge, and other habitat-forming species are, in many cases, likely to harbor undiscovered and endemic species. As noted by the UN’s World Ocean Assessment: “There is strong evidence that the richness and diversity of organisms in the deep sea exceeds all other known biomes… and supports the diverse ecosystem processes and functions necessary for the Earth’s natural systems to function”. The risk of extinguishing whole species never before seen is, therefore, particularly high when bottom trawling strips the seamount surfaces of their coral and sponge habitat. Specifically, considerable damage to deep-water coral communities has been recorded off both coasts of North America, off Europe, from Scandinavia to northern Spain, and on seamounts near Australia and New Zealand. The Institute of Marine Research in Bergen, Norway, estimates that one-third to one-half of the cold-water coral reefs in Norwegian waters have been damaged or destroyed by bottom trawling. Photographs document giant trawl scars along the seabed up to 4km long. On the high seas south of Australia, in an area known as the South Tasman Rise, observers recorded trawlers bringing up an average of 1.6 tons of coral per hour in their nets in 1997 — the first year of the area’s orange roughy seamount fishery. Up to several thousand tons of coral were estimated to have been brought up in the nets of the 20 or so deep-sea trawlers working in the area. This figure does not include coral that was damaged but not brought up in the nets. By contrast, the catch of orange roughy in the first year of the fishery was reported to be less than 4,000 tons. In addition to the physical impacts of bottom fishing on deep-sea ecosystems, the depletion of deep-sea species is a matter of international concern. Unlike shallow-water species, deep-sea species are often slow-growing, long-lived, “low productivity” species that are highly vulnerable to depletion. Most high seas bottom fisheries target low productivity species such as orange roughy in the South Pacific and Indian Oceans, grenadiers in the Northeast Atlantic, redfish in the Northwest Atlantic, and deep-sea sharks (often caught as bycatch in deep-sea fisheries in the Atlantic, Pacific and Indian Oceans and marketed to the cosmetics and dietary supplement industry for their liver or “squalene” oil). In addition, a large number of species have been recorded in the bycatch of many high seas bottom fisheries, in particular bottom trawl fisheries, the majority of which are likely to be low productivity species. The status of target and bycatch species in the deep-sea fisheries on the high seas is largely either unknown or, where information is available, considered overexploited or depleted. Regulations are in place in some high seas fisheries to manage the target catch in deep-sea fisheries. However, few, if any, of the fisheries impacting deep-sea stocks or species on the high seas can currently be considered sustainable. Plastic in Bottom Trawl Bycatch. Photo: Mike Markovina/Marine Photobank. The International Union for the Conservation of Nature (IUCN) Shark Specialist Group classifies the three main species of deep-sea sharks (leafscale gulper shark, Portuguese dogfish, gulper sharks) in the Northeast Atlantic as endangered or critically endangered. In the South Pacific, New Zealand reports a total of 137 species of fish caught in the deep-sea fisheries on the high seas; the status of these species and the impact of the fishing on these species are unknown. At least 50 species have been recorded in deep-sea trawl surveys along the Emperor seamount chain northwest of Hawaii in the North Pacific, where deep-sea vessels from Japan, Russia and Republic of Korea continue to operate on the high seas. The UN FAO report estimated that the global catch in high seas bottom fisheries in 2006 was approximately 250,000 tons, representing 0.3% of the marine catch worldwide. 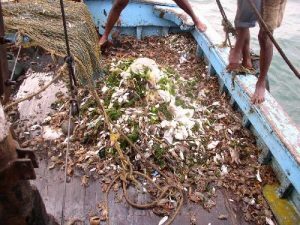 The value of the high seas bottom catch in 2006 was estimated at approximately US$ 450 million, a small fraction of the US$ 75 billion overall value of marine catch worldwide. The conclusions of the UN FAO report were similar to the findings of a study on high seas bottom trawl fishing published by IUCN in 2004. NMFS 2001. “Draft Programmatic Groundfish Supplemental EIS.” Jan. 2001 Tables 4.7-4 and 4.7-5. Cheung WWL, Watson R, Morato T, Pitcher TJ, Pauly D. Intrinsic vulnerability in the global fish catch. Marine Ecology Progress Series 2007;333: 1-12. From: Report of the Working Group on the Biology and Assessment of Deep-Sea Fisheries Resources (WGDEEP). 3–10 March 2008. Copenhagen, ICES Headquarters. ICES CM 2008/ACOM:14. 531pp. Pages 70–71. Bensch, A., Gianni, M., Greboval, D., Sanders, J.S. & Hjort A. 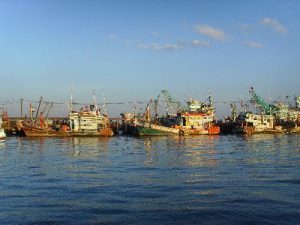 World Wide Review of Bottom Fisheries in the High Seas. Food and Agriculture Organization of the United Nations. Rome, 2009. COMMUNICATION FROM THE COMMISSION TO THE COUNCIL AND THE EUROPEAN PARLIAMENT: Review of the management of deep-sea fish stocks. Brussels, 29.1.2007 COM(2007) 30 final.